What I really liked was that you said ‘the church Piper served’. Its great to see someone NOT saying the ‘church N lead’. Modern church life seems dogged in this respect by contemporary pop business obsessions with ‘leadership’, when we know that we are lead by the Spirit of God…as people, we merely serve in different ways. I guess Piper-Wright debate on justification tends to theological a priori (Piper) vs. biblical narrative priority (Wright) discussion. I guess while Piper is much fixated on ordo salutis perspective when it comes to exegeses of relevant passages with individual salvation emphasis, Wright is trying to be open-minded theologically: he wants to follow what the text says whatever its theological outcome (to destroy or disfigure the neat theological summing-ups). Concerning Bird, my question is, is it enough to adjudicate just two scholars’ views to reach what the Bible teaches about justification? Well, I must say since the debate has a huge impact on thinking evangelicals Bird does a great service by doing so. I just wish a new fresh voice will come and open up a new vista. That’s what NPP should be aiming at. yeah, and both seem to have some great strengths (theological and biblical narrative). I think that’s why I appreciated Bird’s comments so much. Thank you for your clear and thoughtful review. I find the lines taken by Wright and Piper confusing. Wright rejects the term “imputed righteusness” while affirming something very close to it. He says that justification is the declaration of God about us that we are righteous. What he objects to is saying that it is specifically the righteousness that God declares is ours. Piper subscribes to the term “imputed righteousness” but then strongly argues that this is moral righteousness which makes sit sound like imparted righteousness to me. 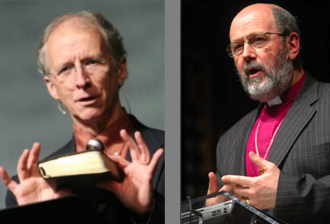 There are a number of other significant voices in this justification conversation, many of whom disagree with Wright but are in the same ball park in some way–Doug Campbell (The Deliverance of God) and Michael Gorman (Inhabiting the Cruciform God) are two (and their respective major works on justification). Gorman’s approach to justification is, I think, that fresh voice–and his style and scholarship are top notch. Not exactly “new perspective”–though some would lump him in, but has a narrative approach and views justification in a participatory sense. Thanks for replying to my comment. Fresh voices like Campbell and Gorman sound interesting. I haven’t read both but hear Campbell’s argument somewhat too convoluted and hard to assess. I frequent Gorman’s blog and like what he says. I think it’s time to read some of his books. Have you had a chance to read Das’ Paul, the Law, and the Covenant? I have yet to read it fully, but found his summary of the 2nd Temple Judaism quite a bit different than Sanders’. No. I haven’t heard his name. The book seems a careful, scholarly book on the subject. It has a good endorsement from Richard Hays, one of my favorite NT scholars. Do you know any good review on the book available on the net? But at any rate thanks for mentioning him and the title. I’m not sure of any good reviews online, but I know that many of those who find Wright’s interpretation of the early Jewish sources to be questionable (and Sanders’, etc.) have found this book to strengthen their reasons for rejecting it (Schreiner was where I first heard of it). As I stated, I haven’t read it all yet, but found the parts that I scanned to be pretty good! It’s not my greatest happiness that Bird (Feb 2007) wrote “No one will be justified if they do not persist and persevere in faithfulness” (Saving Righteousness of God, p. 177). That’s a faith-plus-works condition for the justification that will be, however much, like Trent, it begins with faith. Fantastic insight Luke. What did you mean by our good works?